Have we found the key to the mysterious Voynich Manuscript code? The mysterious, 15th century Voynich Manuscript is full of codes and bizarre illustrations. Most experts believe it's a hoax, a nonsense book created to fire our imaginations. But now there's new evidence that it may be written in a lost Aztec language, Nahuatl. Don't get too excited — people have been saying they've unlocked the code to the Voynich Manuscript for decades. It's such a common idea that it's turned up in fantasy tales from Codex, by Lev Grossman, to Assassin's Creed. But now, reports Lisa Grossman in New Scientist, there's a new wrinkle. 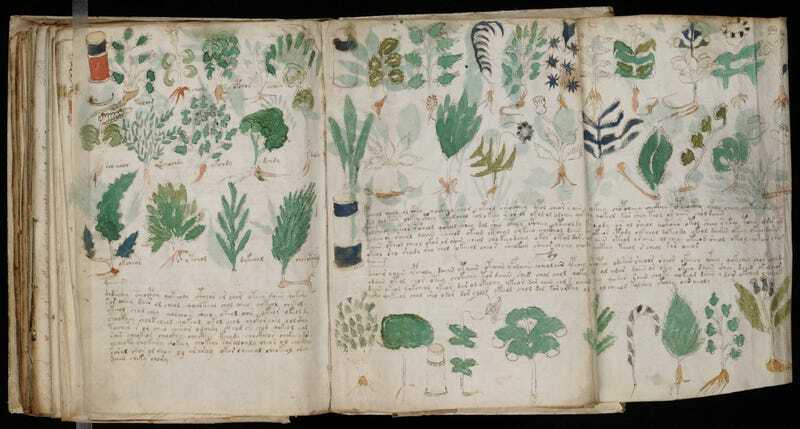 A botanist named Arthur Tucker has discovered that several of the plant illustrations in the Voynich Manuscript look like plants found only in the New World. Botanist Arthur Tucker of Delaware State University in Dover noticed similarities between certain plants in the manuscript and illustrations of plants in 16th century records from Mexico . . . On the basis of these similarities, [he and colleague Rexford Talbert suggest] that the manuscript came from the New World, and that it might be written in an extinct form of the Mexican language Nahuatl. Deciphering the names of these plants could therefore help crack the Voynich code. The great Aztec civilization, located partly in the region now called Mexico, was known to have produced many great works of literature and philosophy. Most of these were lost in the wars and plagues of the sixteenth and seventeenth centuries. So this idea is intriguing. Of course, the similarities to illustrations of Mexican plants could also be part of a centuries-old hoax. If the hoaxer had lived during the fifteenth century, he or she might have seen illustrated books about the New World and copied images of plants from there. Another possibility is that the hoaxer lived long after the fifteenth century, which would have made access to such books even easier. It's pretty good odds that you'll find plants in the world that happen to look like the Voynich manuscript just by chance. If I sat down with a random plant generator software and got it to generate 50 completely fictitious plants, I'm pretty sure I could find 20 real plants that happen to look like 20 of the made up plants.